Arakan had been an independent kingdom for over four millennium and its relations with Bengal was very intimate, specially Chittagong, the southeastern part of Bangladesh, which derived its name in consequence of the victory over local chieftain by King Chula Taing Chandra of Arakan in 953 AD1. The subordination of Chittagong to Arakan is corresponded to the absence of supremacy of other royal claimants over the region. The statement of the Arakanese chroniclers may, however, be taken as a proof of the Arakanese lordship over southeast Bengal. Arakan, “in fact, a continuation of the Chittagong plain,”2 was neither purely a Burmese (Myanmar) nor an Indian territory till the 18th century AD the land that has been called Arakan by the foreigners is known to its own people Rakhaing-pray and call themselves Rakhaing-tha. The word rakkha means guardian, pray means land and tha meaning son. Hence, Rakhaing-pray and Rakhaing-tha means ‘land of the guardian’ and ‘son of the guardian’. The Bengali on the other hand refer them as Magh, the word adopted in the 17th century, to mean it with degrading appellation. Neither the Arakanese nor any other Mongoloid brethren ever speak or write of themselves as “Magh” as it has been alien to them. The European travelers and chroniclers refer them as ‘Recon, Rakan, Arracan, Aracao, Orrakan, Arrakan, Arakan’. In colloquial Chittagong dialect, the country is called ‘Rohang and Roshang’. All these various forms are closely related to the original one ‘Rakhaing’ (or Rakhine)3. Mung Saw Mwan alias Narameikhla, King of Arakan when expelled by the Burmans from his Kingdom, Laungrat, found shelter in the court of Gaur for 22 years and was reinstalled on his throne in 1430 AD. He thereupon built himself a new capital named Mrauk-U in 1433 AD, which for the next four centuries known as Mrauk-U dynasty, the last in the series of dynastic rule. His successor Mung Khari alias Ali Khan (1434-1459 AD), established peace with the eastern neighbour, the Burmese king, repossessed Penwa (Ramu, in Cox’s Bazar district). Like his predecessor he and his successors continued to use Persian (Mohammedan) titles, no long as a sign of vassaldom but as a token of their sovereignty over Chittagong4. Benefiting from trade with Bengal and Malacca, Arakan became so prosperous and powerful that, his successor Ba Saw Pru alias Kalim Shah (1459-1482 AD) occupied Chittagong in 1459 AD5. This important port remained under Arakanese control with irregular incursion from Tripura and Sultan of Bengal. However, from about 1580 AD till its subjugation by Shaista Khan, in 1666 AD for nearly a century, Chittagong almost uninterruptedly was under Arakanese rule, which is undoubtedly an important period marked by momentous events. During this period, a company of eight sovereigns successively ruled Arakan along with southeast Bengal (comprising the present districts of Chittagong, Cox’s Bazar, Bandarban, Rangamati, Khagrachari, Feni and Noakhali) with full despotic power. In the mid 16th century the European ships made their appearance, as raiders, and the Portuguese freebooters (feringhe) began to settle at Chittagong6. Unlike the other races of Burma (Myanmar), the Arakanese maintained sea-going craft and Chittagong bred a race of competent seamen. The union with the Portuguese marked the high watermark in Arakanese history. The thriving port of Chittagong was always held either by a second son or a brother or a faithful clansman of the king, with an Arakanese garrison. Every year the king sent a hundred boats full of troop, powder and ball, and then the garrison and boat sent in the previous years returned home to (Mrauk-U capital of) Arakan7. During the Arakanese rule Chittagong was divided into three divisions Diang, Chakrashala and Penwa. Diang was the commercial centre with port and a strong naval base. The fort, according to Talish’s narration8, connected all the hills, high or low encircling the Laldighi tank. The residence of the Arakanese viceroy of Chittagong was situated within the fort. The principal Buddhist temple was situated on the Rangmahal hill from where a large image of Lord Buddha has recently been dug out9. The paper tries to sketch out a brief account of Arakan focusing on its rule on southeast Bengal from 1580 to 1666 AD. 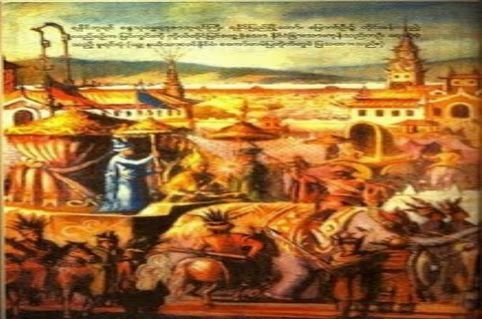 Mung Phaloung or Sikander Shah (r.1571-1593 AD) was the 17th king of the Mrauk U dynasty and youngest son of King Mung Ba Gree or Zabuk Shah (r.1531-1553 AD) the 13th king of the line. Ralph Fitch, the British traveler who was at Chittagong in 1585 mentions Chittagong along with Ramu as subject of Arakan10. The significant event during Mung Phaloung’s reign is that in 1586 Arakanese army attacked Udoypur, capital of Tripura, from which they could never regain power to challenge the supremacy over Chittagong. The king of Arakan himself led an army to Dhaka and stationed two battalions at Jugdia and Alamdia11. During the initial years of his occupation of Chittagong, Mung Phaloung appointed two Uzirs–one Jalal Khan in the northern Chittagong and the other Adam Shah in the south. In Arakanese, the Chittagong governor is called Saitagong-za and Saitagong-mung. Ashun Sandamala Lankara12 confirms appointment of Chittagong Uzir to one Jalil in Arakanese era (AE) 936 (i.e.1574 AD) but did not mention about the governor. The reverend author further reveals that as the western territory expanded the king created some new posts as Anouk-barang, Murshidabad governor and Dhaka governor where he appointed Thadoe Mung Saw Hla - king’s second son, Uttama Kyaw Khoung and Koung Nyet Thu respectively13. Some historians mentioned Anouk-barang as Anaporan or Anik Farank while referring to the Chittagong Governor. Anouk means west, barang means king so Anouk-barang means ‘western king’ or ‘king of the western theatre’. Ashun Sandamala Lankara clearly says that this post was created to enforce administration of tasay-hna-banga (twelve Bengals) including Chittagong. Later, on the other hand, he used it as a title saying Anouk-barang Thadoe Mung Saw Hla was made Saitagong-mro-za means Chittagong Town Governor14. Mung Phaloung after taking full control of Chittagong minted two ‘Chittagong type’ silver trade coins with both sides in Arabic language with his Arabic regnal name “Sikandar Shah” with Hijri date (AH) 983 (i.e.1574 AD) and 992 AH (i.e.1583 AD). These coins appear to have been struck exclusively for trade in Chittagong as he had his ‘Arakanese type’ trilingual coin, Arabic and Bengali on the obverse while Arakanese on the reverse side with Arabic name “Sikandar Shah” having Arakanese date 933 (i.e. 1571 AD)15. A silver coin has been surfaced with the title Anouk-barang of 953 AE (i.e. 1591 AD) the date taken as the first single Arakanese administrator of Bengal with the appointment of Thadoe Mung Saw Hla as Anouk-barang. This trilingual coin is with Kalima on the top and Sri Sri Ana/kaphara in Bengali on the obverse and Mung-tara-gree-thadoe Anouk-barang with 953 AE on the reverse16. Mung Raza Gree or Salim Shah (r.1593-1612 AD) succeeded his father’s throne in 1593 AD. In the early years of his reign, the governorship of Chittagong was vested on Maha Pinya Kyaw a great scholar with a religious tune of mind17. It is said that Maha Pinya Kyaw is not a real name but a title meaning ‘great scholar’. No coin of his is known so far. In 1599 AD the Arakanese king joined the prince and viceroy of Toungoo in the latter’s attack against his first cousin Nandabayin, king of Pegu. In this expedition the king of Arakan employed a flotilla from Chittagong and Ganges delta. The Arakanese deported 3000 households – Burmans, Talaing and Siamese of the wretched Pegu flok and returned with a white elephant and a daughter of the fallen king. The event has been written by Michael W. Charney in his ‘The 1598-99 Siege and the Expansion of Arakanese Imperial Power into Lower Burma’18. The king of Arakan married the princess while the prisoners brought from the expedition were settled at Urai-toung, Thandway and along the river of Ngasaraing-choung. On the return voyage the wise governor of Chittagong died and was buried, after cremation, near the Hmawdun pagoda at Negrais. Minister Pinyawantha son of the deceased was soon appointed the governor of Chittagong. Mung Raza Gree after his return from Pegu had issued a trilingual (Arakanese, Arabic and Devanagari) coin with dotted border and dated 963 AE (i.e.1601 AD). Before this he had issued a coin in 955 AE and in 959 AE, 960 AE and 973 AE his successive governors had issued coins19. For a short duration the reign of Mung Raza Gree extended from Dacca (Dhaka) and the Sundarbans to Moulmein, a coast strip of a thousand miles in length and varying 150 to 20 miles in depth20. Fr.Fernandes in his letter written from Dianga on 22nd December 1599 calls Dianga a town (ville) in the Port of Chittagong. It was at about this time that it began to acquire some importance. Besides Dianga could not be a City of Bengala as it really formed a part of the Kingdom of Arakan. As the Portuguese who had establishes themselves in Chittagong extended their activities to Dianga towards the end of the sixteenth century. The King of Arakan owed these ports at this time and in the letters-patent granted to the Portuguese Fathers he styled himself “the highest and the most powerful King of Arakan, of Tippera, of Chacomas and of Bengala; Lord of the Kingdoms of Pegu etc.” Father Du Jarric without referring any name mentioned that the Governor of Chittagong was uncle of the King of Arakan21. The friendly relation between the Arakanese and the Portuguese later turned to a hostile one and Kedar Rai, ruler of Sripur, was helpful while the king of Bakla assisted Portuguese. In 1607 AD the king offered to let the Dutch trade and build fortifications in return for help driving out the Portuguese. In 1610 AD (Mung) Razagree had appointed his younger son, Mung Man Gree or Min Mangri, as Viceroy of Chittagong. A son or a brother of the Arakanese kings was usually posted to that charge and there was nothing usual in (Mung) Razagree’s choice except that Min Mangri was not on good terms with the heir to the throne Min Khamoung his elder brother22.Mung Man Gree was referred by Portuguese source as ‘Alamanja’ or ‘Alemao’. The governor of Chittagong soon broke out into rebellion against his father and entered into an alliance with Gonsalves Tibau, Portuguese pirate-king of Sandwip, who, thought, would save him from his brother and to put him in his brother’s place. The governor who had a sister was baptised by Father Rafael and led her to Sandwip where amid great rejoicings married to Tibau’s son. Mung Raza Gree got furious and immediately sent an army against his rebellious son under the Crown Prince Mung Khamoung who kept besieged Chittagong for four months. As negotiations failed the Crown Prince made violent assault, the rebels surrendered at the death of their leader. As long as Mung Man Gree was Viceroy, the pirate-king (Gonsalves Tibau) was assured of a dominating position at the head of the Bay. With his death and the appointment of a new Viceroy strictly under the control of the King of Arakan, his (Gonsalves) position was threatened23. According to Ashun Sandamala Lankara, soon after his accession, Mung Raza Gree appointed his younger brother Thadoe Mung Saw Hla as the governor of Chittagong in 955 AE (i.e.1593 AD) in addition to the job of Anauk-barang and posted at Chittagong. In 975 AE Thadoe Mung Saw Hla as revolted against his brother, the King marched towards Chittagiong and subdued it. The King then deputed the wise minister Maha Pinya Kyaw to the post of the Lord of Chittagong, Thadaw Mung Digha to the post of Anauk-barang and stationed him at Mauthuza (i.e.Murshidabad) to administer the twelve Bengals. Later Anauk-barang Mung Digha was replaced by Mung Nyo while Kyee Nyo (son of Maha Pinya Kyaw) posted as governor of Rangpru24. At the tragic death of Maha Pinya Kyaw the king appointed Mung Man Gree who was later replaced by Chakkawaday as governor of Chittagong. Soon after Mung Khamoung or Hussain Shah (r.1612-1622 AD) ascended his father’s throne he started resolving the Portuguese affairs. Through the help given by the Dutch ships harbour at Mrauk-U the Arakanese king gave a deathly blow to the already declining Portuguese power in this region. After which the Portuguese ceased to be king’s rivals and became his servents25. In the western side the Mughals were getting stronger under the rule of Jahangir (r.1605-1627) and thereby claimed the right of rule over Chittagong, which, in fact, was being ruled by the Arakanese26. During Islam Khan’s governorship (1608-1612) the capital of Bengal was transferred from Rajmahal to Dhaka. In the beginning of Qasim Khan’s governorship (1613-1617) the Arakanese raid on the Mughal territory was intensified. Qasim’s campaign to take possession of Chittagong ended in a complete failure. There was another attempt of the Mughals under Ibrahim Khan (1617-1624), brother of Empress Nur Jahan, to conquer Chittagong. But their strategies and low morale compelled them to give up their hope for victory. The Mughuls got an exaggerated idea that Arakanese was an impregnable country, its fleet was invincible, and its forces could not be overwhelmed27. Mung Khamoung, emboldened by success, extended his territory in Bengal by occupying a part of what is now the district of Bakergong (present Barisal division), and for a time the city of Dacca (Dkaha)28. The king led an army to his vassaldom, Udoypur, the capital of Tippera in 1615 AD and subdued the rebel leader Chakyamuni thereby propitiatory tribute assured29. Mung Khamoung proved to be the greatest and most successful king and his name is still remembered with pride and affection by the Arakanese people. According to Harvey30, Meng Soe Pyu (1614-1629), would be brother or half-brother of Princess Khin Ma Hnoung of Pegu was made governor of Chittagong. But most of the historians are silent about the governor by this name. Nor one could trace in any of the Arakanese and Burmese chronicles. However the Portuguese source depict different story, with different name, about the so-called brother of the Pegu princes. No coins been surfaced during this period. The controversy thus created needs further in-depth research and studies. Thiri Thudhamma or Salim Shah (r.1622 – 1638 AD) was only twenty years old when he ascended his father’s thorn in 1622. His younger brother holds the governorship of Chittagong and he took strict means in dealing with the Portuguese freebooters31. They became so alarmed that they sent Sebastio Manrique, an Augustinian friar of Oporto, to Mraunk-U, capital of Arakan and intercede with the king that ‘the Portuguese are loyal to you’ 32. During his stay of six months in Arakanese capital, Manrique was shown the belongings received from the Pegu expedition in 1599 and was greatly impressed by the white elephant. Nanda Bayin’s daughter (Khin Ma Hnoung alias Thazoung Me-phara), who had been carried off (from Pegu, capital of Henthawadi) to Mrohaung (Mrauk-U) and married to King Razagri, received him and related the story of her sufferings with deep emotions33. Manrique visited Mraunk-U for the second time in 1633. He stayed there for two years and his books34 tell of further adventures while at the capital of Arakan. He gave a strange account of the king’s coronation in 1635, who deferred twelve years, because of a prophecy that he would die within a year of it. Twelve vassal chiefs were crowned at the same time35. Thiri Thudhamma enforced payment of tribute from Dhaka and in the eastern frontier raided Moulmein and Pegu. Arakan remain on the Dutch programme from 1623 as their ships were going there to buy the Bengali slaves captured by the marauding feringhi (Portuguese), and the surplus rice that the country produced as a result of the abundant slave labour available for cultivating the fields36. But in 1631 the Dutch chief factor, reported that trade had been brought to a standstill by a terrible famine and pestilence. The famine lasted till 1634 and during that period Chittagong was also affected. Thri Thudhamma’s legitimate heir Mung Sani or Thadoe Mung Hla (1638 AD) ascended his father’s throne at his tender age of eighteen. But on the 20th day of his accession he died. Most historians are of the opinion that the dowager queen, Nat Shun May, mother of Mung Sani desiring to have her paramour, her future king had the magic spell, caused with small-pox, upon the new king ultimately died on the 20th day of his installation38. Kuthala was 56 years old when he occupied the throne and took the title of Narapatigree (r.1638 – 1645 AD). He was one of the great grandson of king Thazata, 11th king of Mrauk-U dynasty. He soon enforce massacre of the kinsmen, nobles and artisans to control the affairs unchallenged. He did not take the widow queen to the palace-citadel rather rehabilitated her at a safe distance. O’ Malley39 referring to the Arakanese Chronicle, “During the troubled times, the son of Sri Sudhama, Nga Tun Khin, made his escape from the town and lived in the wilderness; and certain members of the royal family and nobles left for Kantha40, a place in Chittagong and settled down there. Of the 1,00,000 guards who were stationed in Myohaung, 50,000 deserted the king and left the capital, taking with them Nga Lut Roon, who was the priest, and settled down in Kantha under Nga Tun Khin”41. The governor of Chittagong during that period was one Mangat Rai or Mung Re, the identity of whom has been in dispute among the scholars, was displeased over the change of his master. Chittagong District Gazetteers42 says, “Mangat Rai or Mukut Rai .........his father Gaureswa Rai .........the ancestor lived at Tippera district. His family and supporters with 14 elephants and nearly 9000 men (both Arakanese and Talaing) fled to Jahangirnagar. Descendents of Mukut Rai live in village Kadurkhil.” According to Arthur P.Phayre, “Makat Rai is apparently a corruption of Meng Re, signifying – Bold Chief - a title held by the Arakanese governor of Chittagong”43. But according to Dr. S.B.Qanungo, “Manek Rai or Mangat Rai, the murdered Raja’s paternal uncle .......... did not recognise the usurper a king and declared independence in his territory, ............. however, defeated (by the king) and was forced to flee to Dhaka”44. According to Harvey45, Mung Re was the son of Meng Soa Pyu, who became governor around 1629 AD, which was during the reign of Thiri Thudhamma. While settling down in Dhaka he as a rebel king of Chittagong issued a trilingual coins on the obverse in Arabic ‘Muzaffar wasf (?) Amir’ and ‘Sri Sri Muz(affar)’ in Bengali and on the reverse ‘Saitagong Mung Re Kyaw Htan’ in Arakanese without any date46. The force of the new king, Narapatigree, crushed the uprising of Mung Re in 1638 AD. In the same year, the king appointed new governor of Chittagong who issued a trilingual silver coin. On the obverse it bears the title ‘Firoz Shah’ in Arabic and ‘Sri Chatigram Raj Piroj Shah’ in Bengali and on the reverse it bears the date 1000 AE (i.e.1638 AD) with the title ‘Saitagong Mung Siri Jaya Nawratha’ in Arakanese47. The appointment of the governors of Chittagong to which Harvey48 had hypothesised as being a hereditary in nature, may flatly be refuted by adding the statement of Vasant Chowdhury,“It is stated that Meng Re Prue was succeeded by his son Meng Hari Prue but it is unlikely that Meng Re or Mangat Rai during his flight to the Mughal territory had left his son behind49. It is to be regretted that such a historian like Harvey marred the value of his later works by hasty and prejudiced judgement. At the initial period of Narapatigree’s rule Dutch business got on extremely well. But in 1643 the king’s health broke and he lost control over affairs. Then an incident occurred which caused the Dutch to close the factory once more. A frigate belonging to a Dutch free burgher, bound for Chittagong with a valuable cargo of piece-goods, was decoyed into Mrohaung harbour, its cargo confiscated and its captain and crew imprisoned. For eight years the factory was empty, and the Dutch subjected Arakanese shipping to severe reprisals50. Narapatigree’s son, Thadoe Mung Tara (r.1645–1652 AD) who succeeded him tried his best to consolidate the kingdom. He even marched to the twelve Bengal to affirm its sovereignty and territorial integrity51. His dependence on the Portuguese for the defense of Chittagong turned the port town virtually to a haunt of the Portuguese freebooters52. During the reign of Thadoe Mung Tara, the governor of Chittagong minted silver coins with the Arabic title ‘Nizam Shah’ in Bengali on the obverse and ‘Mung Ray Thiha Thu’ in Arakanese on the reverse53. Thadoe Mung Tara succeeded by his son, Sanda Thudhamma Raza (r.1652–1674 AD) and during his reign the governor who was appointed to Chittagong was his cousin who issued coins with Hijri era 1062 (i.e. 1653 AD) with inscription ‘Sultan/Chatagong/Mubaraz Shah’ in Arabic and ‘Mung Ray Than Khaya’ in Arakanese. He is believed to be the last governor of Chittagong under Arakanese rule in Chittagong54. The Dutch factory reopened in 1653 carried on successfully until 1665 due to their internal political crisisis. During this period, Chittagong became a place of refuge for two royal exiles. One Govinda Manikya, the Tippera king and the other was Prince Shah Shuja who was defeated in his struggle for the Mughal throne, had to flee in 1660. The Dagh-Register of 1661 contains three lengthy letters from Gerrit van Voorburg, the chief Dutch factor at Mrohaung, detailing all the news of Shah Shuja, which he could glean. His story was that Shah Shuja brought from Bengali to Diang, a port on the river opposite to Chittagong on (board) the King of Arakan’s armada (fleet). He arrived there on 3rd June 1660. From thence he arrived to the capital on the 26th August (1660)56. D.G.E.Hall summarised the sad event to thus, “on 7 February 1661 Shah Shuja’s residence was attacked and there was another massacre. Shah Shuja was never seen again57. Who, according to Gerrit van Voorburg, “intended to escape from the King’s palace and conquer the kingdom of Arakan for himself”58. The following description carries a concise and vivid accounts of the war of succession fought among the sons of Mughal Emperor Shah Jahan after he fell ill in September 1657. Aurangzeb in his quest for the throne, first defeated the Emperor’s troop in the battle of Dharmat (near Ujjain) on April 15, 1658 and Dara Shukor’s (eldest brother) at Samugarh (near Agra) on May 27, 1658, captured Agra on June 8, 1658 and arrested his father, crushed opposition by Murad (youngest brother) subsequently had him executed, captured Delhi and Crowned himself Emperor on July 21, 1658. Later, on January 5, 1659, he defeated Shuja (second elder brother) at Khajwah (near Allahabad) after which Shuja ran away to Arakan (where he is presumed to be died). Later, Aurangzeb had his eldest brother, and other relatives opposed him, executed and made secure the throne for himself. Shah Jahan died on January 22, 166659. Aurangzeb himself would have executed Shuja but did not like outsiders doing it, ordered Shaista Khan, viceroy of Bengal, to invade Arakan, who mounted his fleet took Sandwip by November 1665 from Dilawar Khan an eighty-year-old ruler of the island. Dilwar and his son Sharif were wounded and captured where Dilawar breath his last in Jahangirnagar. The captured of the island paved the way for the Mughal invasion of Chittagong-Arakan. Crossing the Feni river at Jagdia on 14th January 1666 AD, the Mughals entered the Arakanese territory60. At the crucial moment the Portuguese stationed of Diang broke off from the Arakanese, and changed sides with the Mughals, which gave the invaders an upper hand to attack fleet at Kathalia channel and Karnafully river. On the 24th January the fort of Chittagong was besieged and capitulated on 26th January 1666 as Arakanese abandoned the city and endeavoured to escape. Munawwar Khan (grandson of Isa Khan) in search of plunder burnt down most of the homes in the town by reckless fire61. About two thousand were made prisoners and sold as slaves62. According to Alamgirnamah, “The governor of Chittagong, who was the son of the Arracan king’s uncle, was taken prisoner with one son and some other relatives and nearly 350 men of the tribe”63. It as a decisive blow to the prosperity of the Arakanese, and with it their century of greatness came to an end. Since that time the Arakanese have never held any of the country north of Rumu64. Chittagong was renamed Islamabad and Buzurg Ummed Khan was appointed the first Mughal faujdar. They were required to defend the frontier and if possible to extend it southward at the cost of the Arakanese held territory. As the effectively administered Mughal territory extended southward up to modern Satkania U.Z(upa-zila i.e sub-district) so almost all the tarafs are situated within this limit. Tarafs are most numerous in Patiya, Raozan, Rangunia, Hathazari, Satkania, Nizampur, Bhatiyari, Kumira, Kotwali and Phatikchari U.Zs65. No tarafs are located in Teknak, Ukhia, Ramu, Moheshkhali, Kutubdia and Chakaria U.Zs as they remained almost wholly beyond the pale of Mughal dominion66. The tradition of literary activities in Chittagong was strengthened during the Arakanese rulers as Bangali literature attained further development67. The noteworthy Bangali poets work under the aegis of the Arakanese rulers were Qazi Daulat, court-poet Alaol, Kabi Madan, Quorish Magan, Abdul Karim, Shamsher Ali, Abul Hossain and others whose work kept the Bengali literature alive through encouraging support by the enlightened rulers of Arakan and their influential courtiers. It is interesting to note that the history of Bengali literature which was cultivated by the Hindu poets under the patronisation of the Muslim rulers in its sixteenth century was in the succeeding century the Muslim poets came to the forefront in the development of Bengali literature under the patronisation of the non-Bengali and non-Muslim rulers in an alien country. 1 Banerjee, A.C. 1964. The Eastern Frontiers of British India. A.Mukherjee & Co.Pvt. Ltd. Calcutta. . 38 p.
2 Hamilton, W. 1971. A Geographical, Statistical and Historical Description of Hindustan. Oriental. 800 p.
3 Qanungo, S.B. 1988. A History of Chittagong. Vol: 1, Signet Library, Chittagong, Bangladesh. 232 p.
4 Hall, D.G.E. 1985. A History of South East Asia. Macmillan Education Ltd. 4th Ed. Hong Kong. 413 p.
5 Banerjee, A.C. op. cit. 38 p.
6 Hall, D.G.E. op.cit. 413 p.
7 Harvey, G.E. 1964. History of Burma-from the earliest times to 10 March 1824. Frank Cass & Co. 141 p.
8 Qanungo, S.B. op.cit. 636 p. Also see: Shihabuddin Ahmed Talish-Fathya-i-ibbriya. A portion translated by J.N.Sarker in the Studies in Aurangzib’s Reign. 9 Qanungo, S.B. op.cit. 636 p.
10 Qanungo, S.B. op.cit. 233 p. Also See Bangladesh District Gazetteers-Chittagong. 1975. 69 p.
11 Bangladesh District Gazetteers-Chittagong. (BDG - Ctg) Ed. S.N.H.Rizvi. 1975. 70 p.
13 Sandamala-lankara, Ashun. op.cit. 90 p, 117 p, 118 p & 132p. 14 Sandamala-lankara, Ashun. op.cit. 143 p & 144 p.
15 Deyell, John. The Trade Coinage of Chittagong Region in the Mid-sixteenth Century. Journal of the Asiatic Society of Bangladesh (JASB) Vol:40. No:2. Dec 1995. 220-222 p.
17 Qanungo, S.B. op.cit. 239 p.
18 Charney, Michael W. The 1598-99 Siege and the Expansion of Arakanese Imperial Power into Lower Burma. Journal of Asian History. Vol:14/1. 1994.41-57p. 19 Chowdhury, Vasant. op.cit. 151 p.
20 Collis, M.S. in collaboration with San Shwe Bu. Arakan’s place in the civilization of the Bay. Journal of the Burma Research Society (JBRS) Vol:15. Part:1. 1915. 43 p.
21 Campos, J.J.A. 1919 History of the Portuguese in Bengal. Butterworth & Co(India) Lid. Calcutta. 77 & 78 p.
22 Collis, M.S. in colabration with San Shwe Bu. Don Martin 1606-1643. The first Burman to visit Europe. JBRS. Vol: 16. Part:1. 1926. 12 p.
23 Collis, M.S. op cit. 17 p.
24 Sandamala-lankara, Ashun. op.cit. 143 & 144 p.
25 Harvey, G.E. op.cit. 142 p.
26 Qanungo, S.B. op.cit. 255 p.
27 Qanungo, S.B. op.cit. 264 p.
28 Phayre, A.P. op.cit. 177 p.
29 Sandamala-lankara, Ashun. op.cit. 167 p.
30 Harvey, G.E. Bayinnaung’s Living Descendant:The Magh Bohmong. JBRS Vol:XLIV. June 1961.36 p.
31 Qanungo, S.B. op.cit. 265 p.
32 BDG - Ctg. op.cit. 80 p.
33 Hall, D.G.E. op.ci. 418 p.
Hakluyt Society. London. And also see: Collis, M.S. 1924. The Land of the Great Image. London. 35 Harvey, G.E. op.cit. 145 p.
36 Hall, D.G.E. op.cit. 417 p.
37 Chowdhury, Vasant. op.cit. 147 & 151 p.
38 Aung, San Tha. 1979. Rakhaing Dangah Myah. Rangoon (Arakanese). 49p & 50 p.
39 O’Malley, L.S.S. 1908. Eastern Bengal and Assam District Gazetteers – Chittagong. 67 p.
40 Kantha: Arakanese call Karnafuly river as Kantha river. Some old Arakanese people of Chandraghuna while narrating their bye gone days state that the present Karnafuly Paper Mill was the old site of Kantha town. 41 Qanungo, S.B. op.cit. 295 p & 196 p.
42 BDG – Ctg. op.cit. 81 p.
43 Phayre, A.P. op.cit. 178 p.
44 Qanungo, S.B. op.cit. 272 p.
45 Harvey, G.E. JBRS op.cit. 38 p.
46 Chowdhury, Vasant. op.cit. 147 p.
47 Chowdhury, Vasant. op.cit. 147 p.
48 Harvey, G.E. JBRS op.cit. 38 p.
49 Chowdhury, Vasant. op.cit. 153 p.
50 Hall, D.G.E. op.cit. 420 p & 421 p.
51 Aung, San Tha. op.cit. 49 p.
52 Qanungo, S.B. op.cit. 272 p.
53 Zan, Aung. Some Interesting Coins of Anauk Barung and Sitetagaung Mong. Rakhine Magazine..
54 Chowdhury, Vasant. op.cit. 148 p.
55 Bu, San Shwe. Report of the Honorary Archaeological Officer for the year ended 31st March 1921. JBRS. Also see Bernier,Francois.1914 Travels in the Mogul Empire 1656-66. Oxford University Press. 56 Hall, D.G.E. Studies in Dutch Relations with Arakan. Part iii, Shah Shuja and the Dutch Withdrawal in 1665. JBRS, 5th Anniversary Publication. No2. Vol:xxvi. 1960. Rangoon. 23 & 24 p. Also see: Qanungo, S.B. op.cit 302 p.
57 Hall, D.G.E. 1985. A History of South East Asia. 422 p.
58 Hall, D.G.E. JBRS. Vol:xxvi. op.cit 90 p.
59 Rao, General K.V.Krishna. 1991. Prepare or Perish – a study of national security. Lancer Publication. 60 BDG – Ctg. op.cit. 84 p.
61 BDG – Ctg. op.cit. 85 p.
62 Phayre, A.P. op.cit. 180 p.
63 Qanungo, S.B. op.cit. 286 p. Also see: Kazim, Muhammad. Alamgirnamah. Trns: J.N.Sarkar. in the Studies in Aurangzib’s Reign. 64 Phayre, A.P. op.cit. 180 p.
65 Qanungo, S.B. op.cit. 421 p. Also see: Hunter, W.W. 1973. A Statistical Account of Bengal. D.K.Publication. (reprint). 176 p & 177 p.
66 Qanungo, S.B. op.cit. 421 p.
67 Karim, Abdul (Sahitya Visharad) and Haq, Dr. Enamul. 1935. Arakan Rajsabhay Bangla Sahitya. Gurudas Chatterji & Sons. Calcutta. (Bengali).